No, not food. Just a miscellany of things for the weekend. This is my new water cup. My beautiful daughter in-law bought it for me for Mother’s Day. I think it is supposed to be a coffee travel mug, but it doesn’t fit under the Keurig (!) 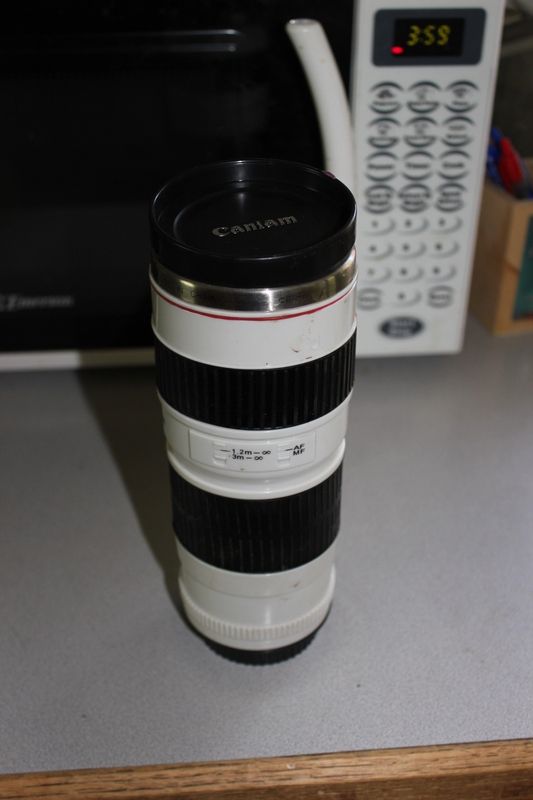 and it doesn’t have a hole in the “lens cap” for sipping – you have to take the cap off to drink. But it works wonderfully as a water travel mug, and I desperately need water more than I need coffee. I love the zoom-lens look. This is what I am driving for the next few days. It’s a Hyundai Santa Fe. It’s gotten great reviews on the Interwebs, but I think it handles sloppy and it has a terrible blind spot on the passenger rear side. I put the seats down and that helps a little bit. It’s also built for a tall person, so the seatbelt at it’s lowest still cuts into my neck and the head rest is at an awkward place. 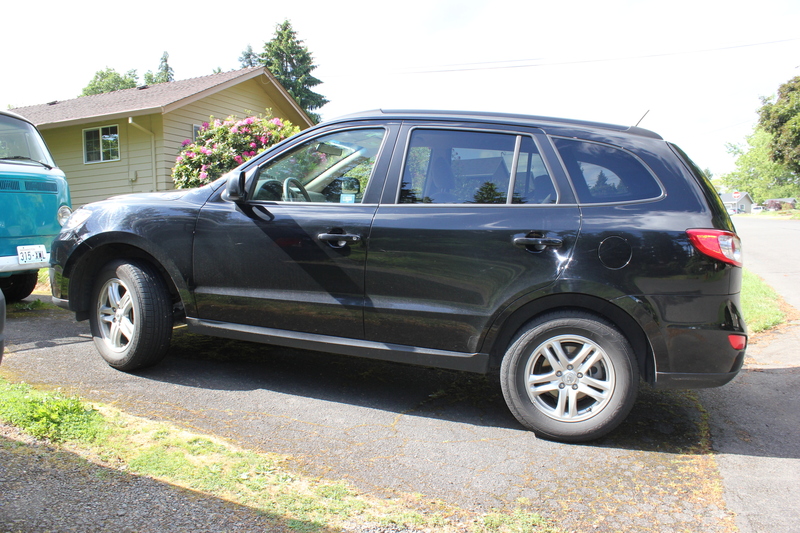 It has more clearance than my KIA, but I can’t back away from the driver side air-bag: it’s about 10 inches from my chest and even with the steering wheel tilted down, it is aimed upward at my head and the awkward head rest. 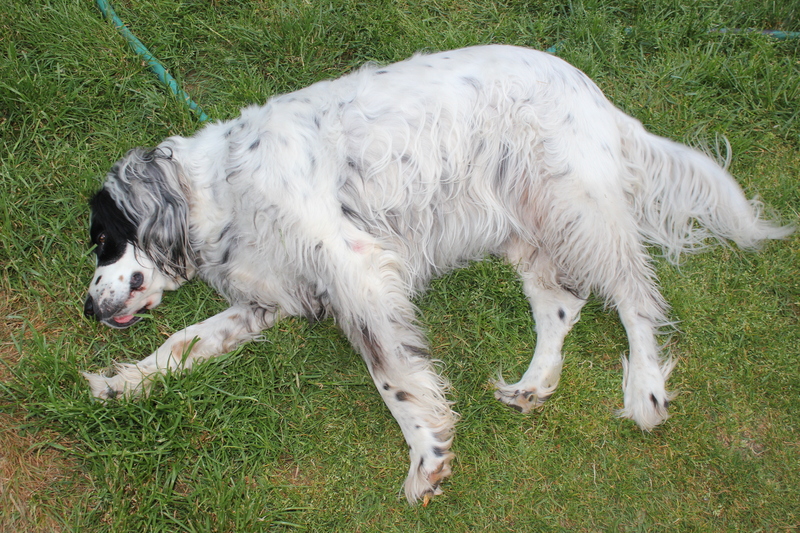 This is my hot, fat English Setter last week. He’s begging for belly rubs. I had just finished brushing him. 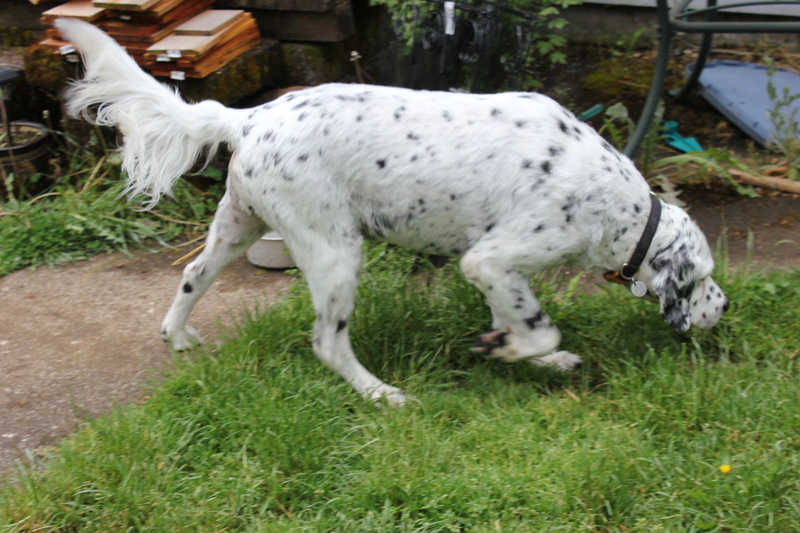 This is my cool English Setter as of yesterday. 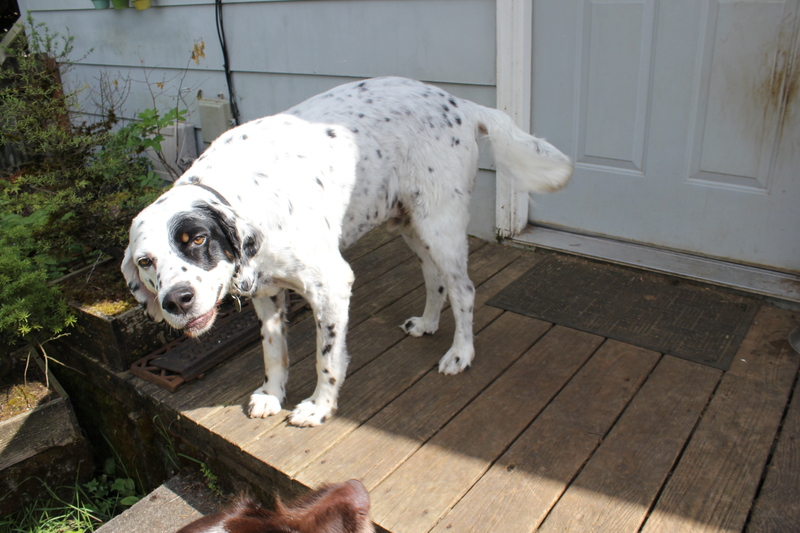 He went to Melissa’s Furry Friends in Beavercreek, Oregon (don’t blink, you’ll miss it) and came home all clean, shaved, and toenails trimmed. 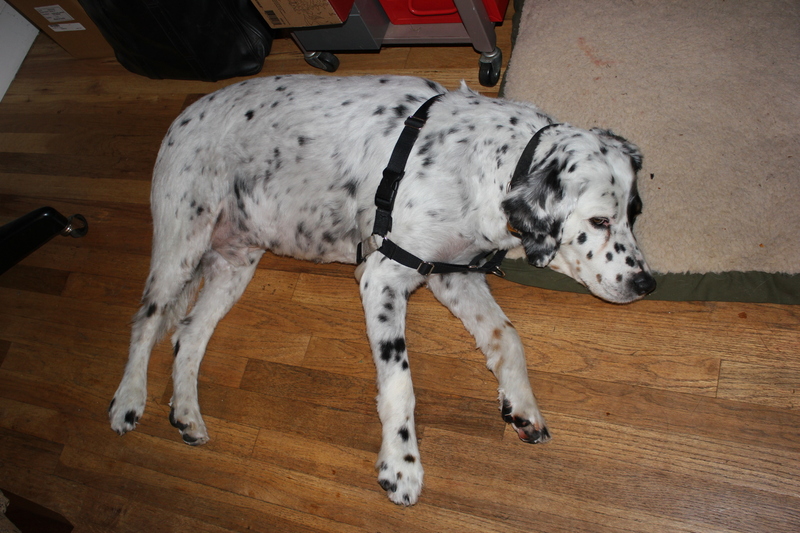 He now looks like a fat Dalmatian. 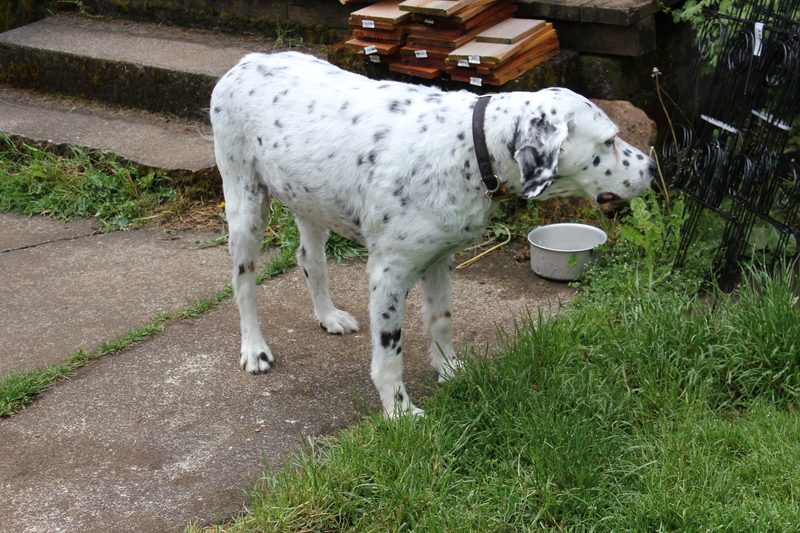 A fat Dalmatian with a feathered tail, that is.